A young Iranian boy, who had been photographed wearing a white shirt with a paper tag bearing the name of professional Iranian footballer Alireza Jahanbakhsh Jirandeh on, has finally come face-to-face with his idol. Last month, 24-year-old Jahanbakhsh, who plays as a winger and attacking midfielder for professional Dutch club AZ Alkmaar and the Iran men’s national football team – nicknamed Team Melli, published the picture on his Instagram page, asking people to let him know if they are aware of the boy’s whereabouts. 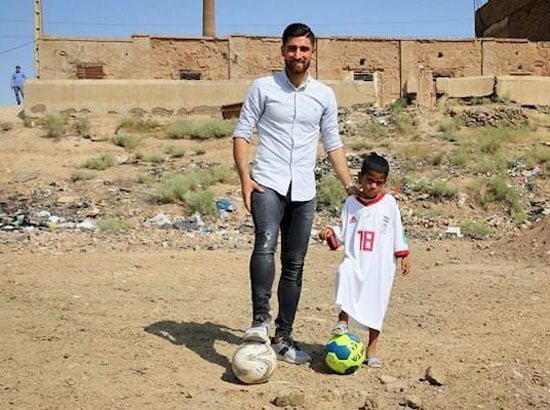 Jahanbakhsh’s fan was finally identified and tracked down to Khavar Shahr village, which is located on the southern outskirts of the Iranian capital city of Tehran. The Eredivisie top goal scorer then went to Khavar Shahr, where he met his fervent young supporter, who goes by the first name Matin, and a number of his friends. Jahanbakhsh presented them all with balls and shirts, and also autographed his own shirt, which read “Dear Matin, I wish you the best of luck in your future,” and gave it to the child. The Iranian football star then played with the children, before saying his farewell to them and leaving the village.